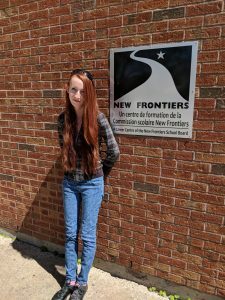 NFSB Continuing Education » Meet Shania! Q: What did you enjoy most about your first year at HAECC? A: I liked the work I did in class and how it prepared me for my stage. Q: Tell me about your stages. I was at Heritage Elementary School for my second stage. I helped the teacher in the class by helping students stay on task and do their assignments. I also worked at the Huntingdon Hospital (Centre d’hébergement du comté de Huntingdon) for the seniors who stay there. I updated the calendar of activities, played cards and did other activities with the people, had conversations, and selected music so they could sing and dance. I also helped to decorate the home for each season and planted flowers in the yard. Q: What did you learn about yourself while on stage? A: I liked the stage work because those opportunities taught me about responsibility, such as being on time and that people were counting on me. I also learned that I am a hard worker and that it feels really good to put in a full day of work.